Note there are few more related projects like audioport for example. After being inspired by brain_hacking project, i've decided that i want to log my motions during sleep for later analysis. I've had PIR motion detector which has quite simple analogue interface. You power it up using 12V and connect what you need to internal NC switch (relay that conducts electricity when no motion is detected and stop conducting for a monment when motion is detected). I wanted my sleep-motion log to contain real time clock. That would mean that i need to make arduino keep RTC and store lots of data, which is very inconvenient. Another solution is to connect arduino to Linux box and use it just to signal PIR sensor state while computer will be doing all the logging. This is much more convenient but wait! Do i really need arduino? I can connect PIR sensor using old keyboard or even my soundcard! Well so i want to interface device which is acting as NC switch with my soundcard… If i connect it directly to microphone input of my soundcard i will probably get nothing more than clicks that will be quite hard to analyze and i will probably not be able to safely tell wheter switch is switched on or off. I had to take everything to another level. I can take some beeping sound generated by some kind of simple 555 oscillator, switch it using my switch and then record it. Sounds like a plan. But then i realized it again… OMG i still have the computer, i can use it to generate sounds for me. So all i need to do is launch some program that will generate sine wave for me (eg. : alsa-utils: speaker-test -t sine) and then i will just route the sound trough PIR sensor and using soundcard again back to computer. Computer will record sound at very low quality using arecord (from alsa-utils again) and then i will be able to analyze state of PIR sensor in time using any audio-editing software which can plot it on the screen. So i've written simple sleepmonitor script to automatically generate sinewave while recording to low-quality wav file with date in it's name. But that was not enough for me. I wanted to detect the presence of sound and generate structured log that can be analyzed afterwards. Some time ago i've been writing software called “beatdetect” which should be triggering some software events based on sound input, but it doesn't performed very well as it had no clue of time or frequency domain. It just triggered event anytime when some audio sample had value bigger than treshold. It was missing few sounds and having lots of false possitives. But i've learned some stuff since those times and i know that if you need to react to the audio signal, you have to react to measurings done in frequency domain - simply measuring intensity of signal is not enough. So i decided to write better software. Goertzel.c is also capable of omitting irrelevant lines from report, so BASH overhead is minimized because data are passed to BASH only when something interesting changes. Program can be configured to let us know only when magnitude of some frequency in signal crosses treshold value. This lowers latency of whole architecture by doing most of processing directly in C code, so BASH script will get notified only when switch changes it's state. 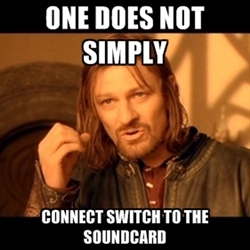 We also do not need to debounce switches connected to soundcard as bounces does not have big effect in frequency domain. Another good thing about this approach is that we can connect lots of switches to single soundcard input. All we need is make them switch different frequencies that do not interferre with each other. Which means that we can connect 2-4 switches using single stereo soundcard (it can generate two different frequencies - one in each channel and both of them can be routed to two inputs if properly separated). If we build some external source of signal we can connect much more switches using more frequencies. BTW you can also find Goertzel for Arduino which can enable you to controll your robots using soundcard, android phone, FM tuner & transmitter or even mp3 player if you don't mind loss of interactivity. Anyway this can be achieved by simple analogue passive envelope demodulator. It is possible to controll servos using soundcard or any similar device capable of audio output. Servo motors have 3 wires: ground, power and PWM signal. While ground is common, power can be obtained from battery or DC adapter and PWM signal can be generated by uC or such kind of device like soundcard or MP3 player.